We are working on a master bathroom remodeling in Buffalo Grove, IL. Check the progress here. We opened up walls between living room, dining room and kitchen. That required of installation of large LVL beam in the attic.We built a new custom kitchen with a farmers sink. New hardwood floors and appliances. June 2017 Home remodeling in Skokie. Project required new master bathroom with custom shower, new kitchen, hardwood floors, painting, deck, new doors and windows, laundry remodeling. May 2017 Steam Shower Installation. March 2017 Addition of two bathrooms to the side of the house. Project required excavation, pouring foundation, framing, plumbing, electrical, roofing, brick laying, windows and finishing two bathrooms. Also, we need to install a water pump to increase water pressure for additional fixtures. December 2016 Converting 3 season room into a den, replacing siding and windows, building a sloping roof. Also remodeling kitchen and removal of load bearing walls. Upgrading electrical and plumbing, installation of additional recessed lights. Replacing kitchen windows with a sliding door. Chicago, IL. It’s a beautiful kitchen with white, custom cabinets, granite counter-tops and hardwood floor. All new appliances including refrigerator, microwave, stove, dishwasher, garbage disposal with a pneumatic switch and a hood vented outside. Old outside door was replaced with a window to add cabinet space. There are two kinds of under-cabinet lights: low voltage halogens and LED. Also, there are eight 6″ recessed lights on two 3-way switches and a pendant light for decoration. Back-splash was done with grey glass tiles. May 2015 2nd Story Addition, Louis St, Mt. Prospect, IL. This is one of the largest projects we have completed. It’s a 1,200 sq feet 2nd story addition with three extra bedrooms, two bathrooms, laundry, staircase and a 2-story foyer. That includes a master suit with a master bath. both baths were tiled with combination of ceramic, marble and glass mosaics. The entire 1st floor was also gutted and up remodeled. Because of additional bathrooms, the water service was increased to 1-1/2″ copper tubing. The second floor has its own furnace and air-conditioning system with a separate thermostat. All electrical wiring was replaced and new 200 amp panel installed. Hardwood flooring was installed/refinished throughout the house, no carpet here. The attic was insulated with with blown insulation of R-49 value and new and existing walls with R-13. January 2015 Room Addition, Mt. Prospect, IL. We just finished a small addition at Willow Ln in Mt. Prospect. We added a room 12′ x 14′ in the back of the house and relocated entrance to existing bathroom. The project included excavation, foundation, framing, electrical, insulation, drywall, flooring ,taping, painting and interior woodwork such doors, windows, baseboards and casings. The exterior work: laying bricks on all three new walls, installation of shingles, soffits, fascia, gutters, downspouts and rebuilding some of the existing deck. We demolished part of existing brick wall in order to make openings for future doors. In the process, I learnt that there were new restrictions when it comes to insulation. Turns out the new building code requires R-49 from previous R-38 value in the ceiling. Also, the concrete slab has to be insulated as well. Despite cold weather the addition was finished on time so the owners’ kids can have a play room for themselves. November 2014 Master bathroom remolding, Grayslake, IL. We have combined a walk-in closet into a master bathroom. New location for the toilet, soaking tub, vanity and custom shower. Serious plumbing challenge, we couldn’t use existing waste lines or supplies. We changed all electric since the new bath has a different floor plan. Travertine subway tiles took awhile to install. Custom shower has a bench and a large double niche. Custom vanity with with sinks just made that bath look even better. August 2013 Master Bathroom, Western Springs, IL. 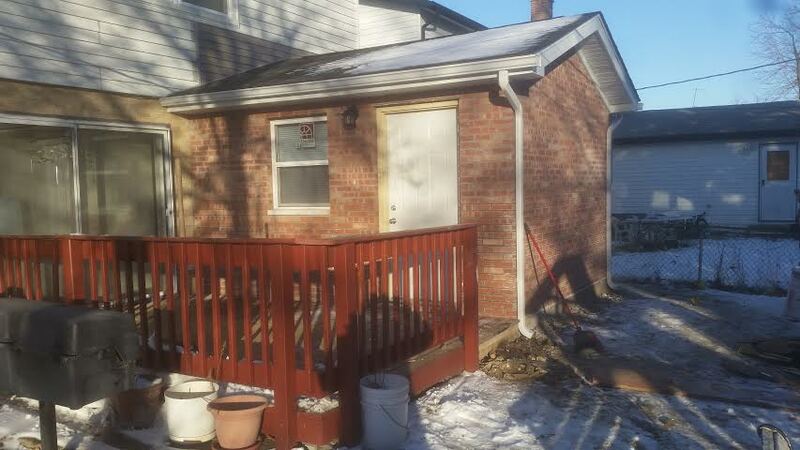 We currently are working on bathroom remodeling in Western Springs, Illinois. The project involves total demolition, tub to custom shower conversion, marble installation, painting trim and vanity installation. We are installing 3 x 6 subway pattern marble tiles, decorative glass mosaic with pencil trim. Also we removed wall-paper from bedroom walls and did some painting.